You are probably wondering why I am featuring a relatively new Mercedes-Benz S-Class that is quite common and outside of being really packed with tech, isn’t all that interesting once you’ve been around it for some time. 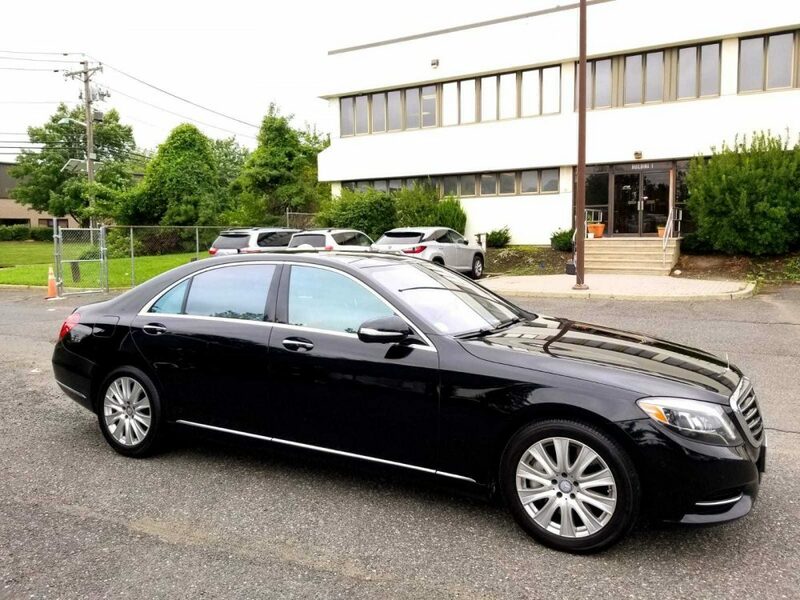 Well, this 2015 S550 4Matic up for sale in New Jersey combines my two favorite things when it comes to German cars: massive depreciation and high miles. Granted, this car doesn’t have particularly high miles at 111,739, but you do the math at the car being roughly three years-old, you can see that thing car has been on the road a lot. When it comes to the depreciation on this car, the numbers get even better. If you’ll allow me to indulge a little bit I’d like to present this…which is insane. Here we have one of the more unique ideas when spec’ing a Porsche. This Liquid Metal Chrome Blue 2015 Porsche 918 Spyder was built to replicate the look of the 918 RSR Concept, which Porsche showed at the Detroit Motor Show back in 2011. A lot of concept cars are conceptual for a reason, but the 918 RSR, since it was to be the racing version of the production car, was truer to the look of the real thing than some over-the-top concepts tend to be. Thus, why not go for that look? And they’ve done a heck of a job of it too! Even the interior color appears to replicate that of the Concept. Of course, they aren’t identical. The RSR was a fixed-roof version of the 918 and the one we see here remains in the standard Spyder configuration. The aero isn’t quite as pronounced either, but this car was meant to be driven on public roads so we can excuse that. Oh, and it has been driven. 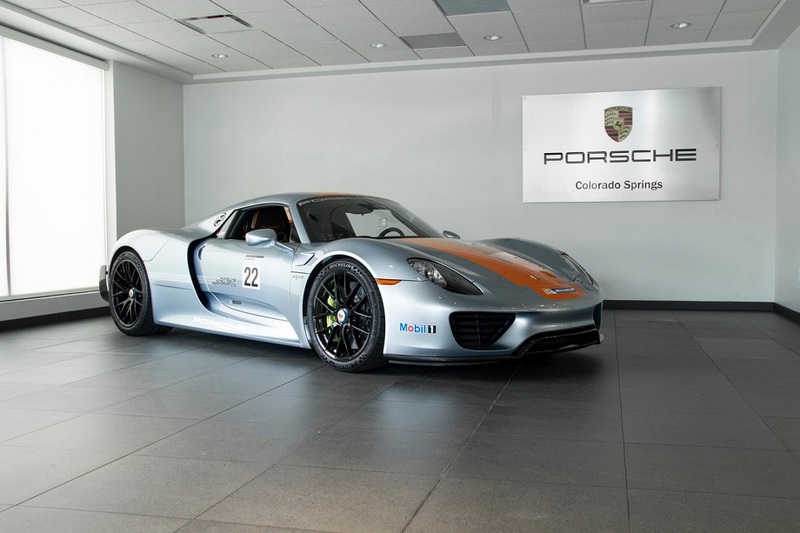 This 918 has 10,363 miles on it! Outside of some exceptionally rare or select AMGs, I don’t really feature a lot of new Mercedes-Benz cars. One big reason is that while this stuff is cool and all, they aren’t all that interesting to me. Another big reason being is that they are all quite common and you can just head down to your local dealer and dodge sales representatives until they figure out you can’t afford anything. After they realize that, their brain tuns to them saying ”Have you ever considered leasing a car?” while you scurry away. Don’t get me wrong, there is nothing wrong with these newer cars, but for me, I enjoy my aged vehicles. Today, I happen to come across a newer, non-AMG, C-Class that peaked my interest because of two things. First being it offers surprisingly great performance numbers and second, it’s amazing depreciation for being only a few years old. 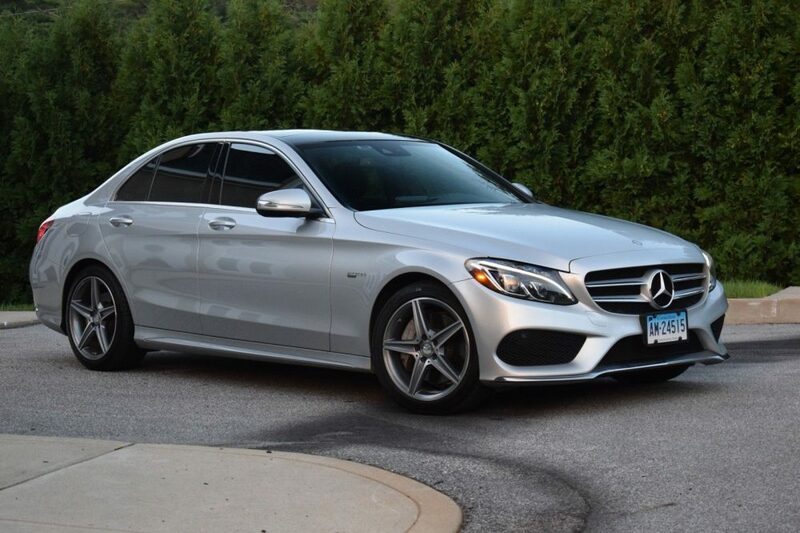 This 2015 C400 up for sale in Connecticut is probably the best bargin W205 on the market right now, if not the best bang for the buck newer Mercedes. Let me explain why. When I first came across this Signal Yellow 2015 Porsche 911 GT3 I could have sworn I had seen it before and already had posted it. The selling dealer looked familiar (and not just familiar as a dealer, but familiar for having this particular car for sale) and the overall look of the car looked familiar. I was sort of right. The car I was thinking of was not in fact this GT3, but a Signal Yellow Cayman GT4. I assume you can see the resemblance. 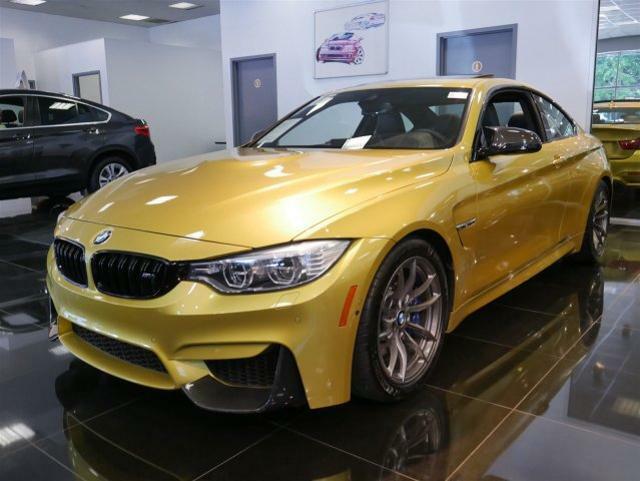 Given that the seller is the same I do wonder if the original owner of both cars was the same person, or maybe the owner of this dealer just really likes Signal Yellow. Regardless, pretty much everything I said about that GT4 applies to this GT3. 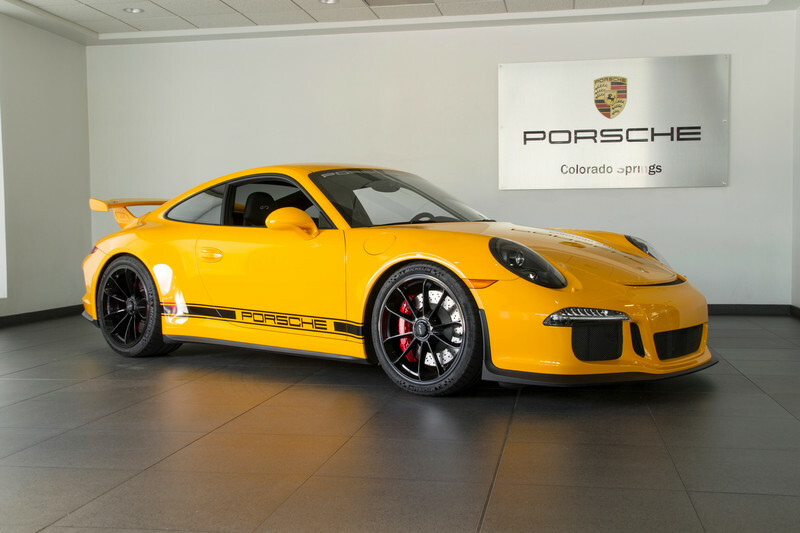 Signal Yellow is one of Porsche’s best historic colors and it looks great in most any application. It has taken me a while to warm to the 991’s design. I’ve always found it too flat and that’s coming on the heels of the gradual flattening of the 996 and 997. It has sort of a stepped on beetle look. I still prefer the more upright windshield of earlier 911s, but ultimately aerodynamics seems to have won out. There wasn’t any particular turning point in my perception of the 991; over time I suddenly found myself walking past them and admiring their looks. Simple familiarity I suppose. I wouldn’t say it’s become my favorite 911 design or anything of that sort, but I have finally begun to enjoy the styling. The performance, obviously, always was easy to appreciate as each iteration of the 911 tends to improve in that regard. There’s no particular reason for leading with these thoughts, though I do wonder if others have found themselves feeling similarly. It does help explain why a 911 like this, which I might have previously ignored, now seems so appealing to me. 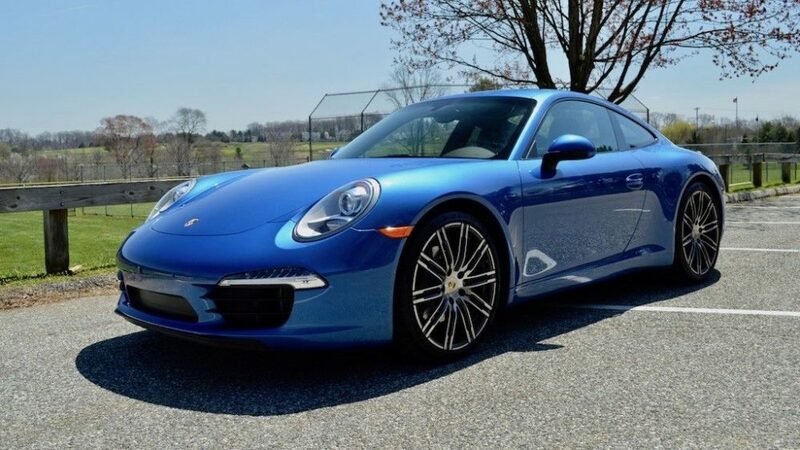 This is a Sapphire Blue Metallic 2015 Porsche 911 Carrera S Coupe, located in Pennsylvania, with 15,350 miles on it. It has the manual transmission and sport seats. It looks phenomenal! I have expressed my love for the Targa numerous times throughout these pages and that naturally extends to the reintroduction of the proper version as part of the 991 lineup. Porsche seems to have pegged the new Targa as the least sporting of the 911 models. It’s only available with all-wheel drive and at its debut I believe it was the heaviest (read: slowest) of the various 911 models you could buy. Though a GTS model eventually was made available it still seems like relative to a comparable Coupe or Cabriolet you’re opting for the Porsche luxury and refinement side of the spectrum. At least so far as their flagship sportscar goes. But let’s be honest, the worst performing 911 still is more than capable of lighting a fire in your belly. While I think it would be great if there were a rear-drive Targa S at some point we make the best of what’s available. I think this one does just that. 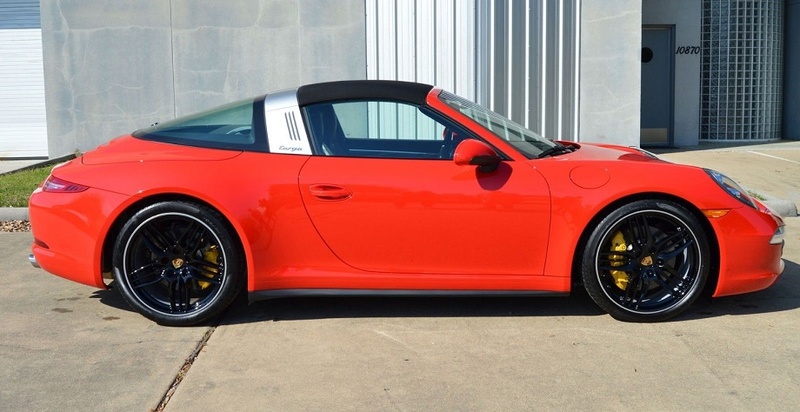 Here is a Guards Red 2015 Porsche 911 Targa 4S, located in Houston, with only 5,100 miles on it. It’s equipped with PDK, adaptive sport seats, PCCB, sport exhaust, and a few other nice items. I have a very specific interest with this post. 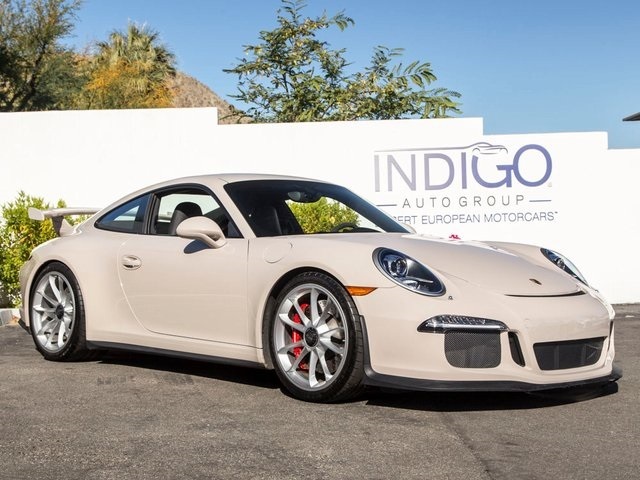 Though even once my question is answered I still think this 2015 Porsche 911 GT3 is worth some attention. My interest: what color is this? I don’t know if I’ve ever seen it. The ad description says it’s Meteor Gray Metallic. The ad also says it has 24,866 miles. The mileage obviously is wrong; the odometer reads 11,137 miles as indicated in other parts of the ad. The color too presumably is wrong, unless Meteor Gray Metallic now looks completely different than it did originally. I’m assuming that isn’t the case and that this is the ad text for a different car. The dealer’s site provides the same text so it isn’t simply a problem with the eBay listing. This 911 GT3 presents me with a do over. A little while ago I came across this Anthracite Brown GT3 and was quite impressed. As GT3s go it was a stunner, though not necessarily in the traditional ways in which these cars attract us. However, I had just written about a couple similar 911s and had a few others I wanted to post. So I sat on it for a little bit. It sold. Darn. 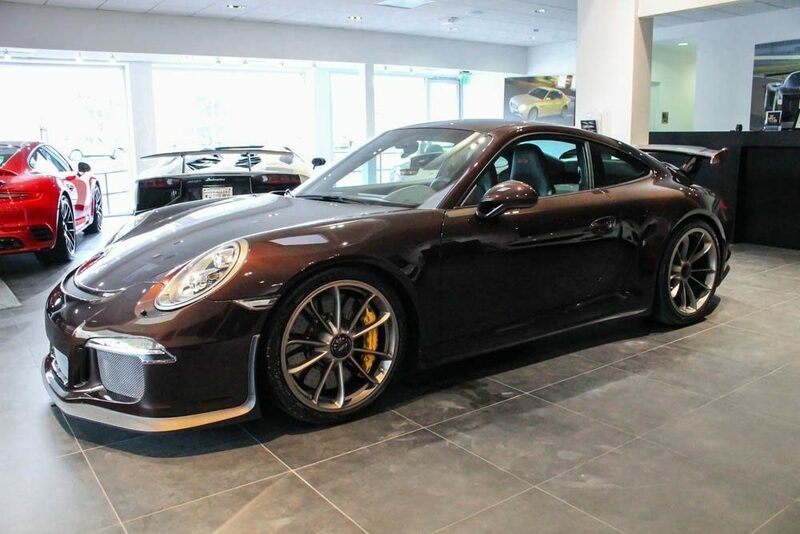 When I first saw this Mahogany Metallic 2015 Porsche 911 GT3 I thought it might actually be the same car. Perhaps this dealer had bought it and was now trying to flip it. Once I read what color it was I knew it was a different car, but it remains no less impressive than that Anthracite Brown example. They are fairly different colors: Mahogany is a much deeper shade of brown than Anthracite, but each still represents a departure from the norm for these models. That makes them quite rare and, for some, also quite desirable. From the first time I saw the 981 I was smitten. The redesign seemed to bring both the Boxster and Cayman into their own better than with previous designs, but it was the Cayman that really caught my eye. The slightly longer wheelbase seems to work very well with the body. It also has a Ferrari 430 look about it, though I’m honestly not sure how I feel about that since the 430 is far from my favorite Ferrari (even if it’s an improvement on its predecessor). Regardless, I like the 981 Cayman quite a bit. That the model culminated with the absolutely wonderful GT4 has drawn me to it even further. I don’t tend to feature them all that often, but this one caught my eye. It’s more subtlety pretty than something that’ll stop you in your tracks. The dark blue is elegant, rather than flashy, and the total package seems a desirable one. 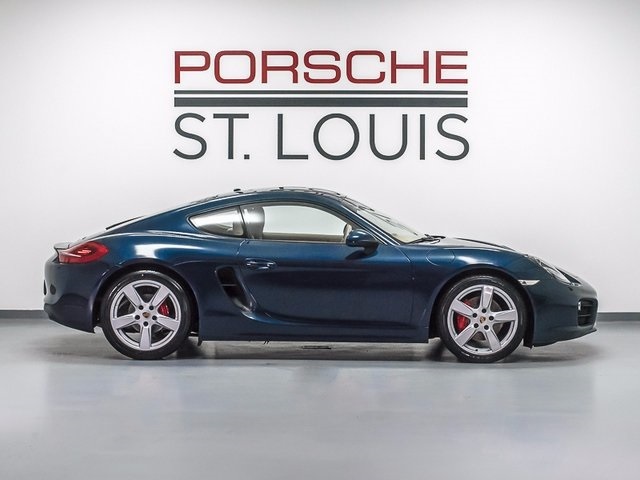 Here we have a Dark Blue Metallic 2015 Porsche Cayman S, located in St. Louis, with Luxor Beige interior and 39,365 miles on it. It’s equipped with power sport seats and a 6-speed manual transmission. Excellent!